Android being an open source OS, has been exploited by the developer community to get most out of it. If you are here then I can guess you have at least some idea of that. Custom ROM, Custom recovery, Android ROOTing are some biggest things that you can customize your device to have. Again, it’s not limited just to the above mentioned. If you have some feature on some phone then it is ported for other set of Android devices within no time by the developers, such as Google assistant which was only there for Google Pixel phones and developer(s) have ported it for other Android devices. Most of such add-on features comes with a recovery flashable zip file. How do you flash those zip files?? 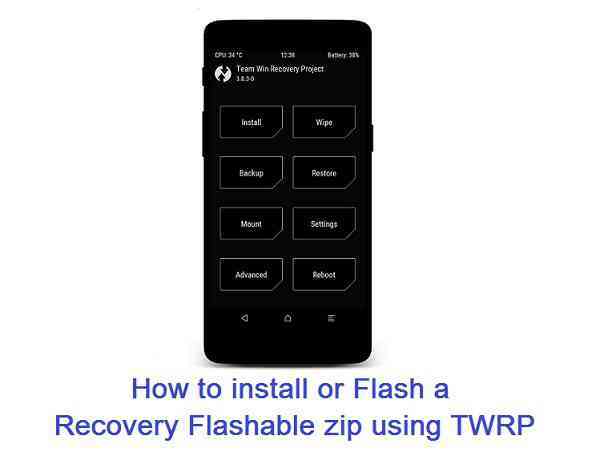 This post will guide you How to flash/Install a recovery flashable zip file on an Android phone or Tablet by using TWRP or any other Recovery. A step by step guide with all required links and necessary steps will take your phone with loaded features. WHAT IS A RECOVERY FLASHABLE ZIP? Most of the android manufacturers release the phone with bootloaders locked and with obviously a stock recovery. The stock recovery can only format data/cache partition of your Android phone and nothing much. The stock recovery is limited only to execute this thing because it has got system access and it may damage if exposed advanced features to users if not handled properly. On the other hand a customized recovery such as a TWRP recovery is exposed with lots of features which can help you installing a Custom ROM on your phone such as: Lineage OS, Resurrection Remix OS, AICP ROM, crDroid ROM etc. It can also provide you a provision to ROOT your Android device. Whether a custom ROM or a ROOTing package, everything comes in an easily installable format using the custom recovery. Unlocked bootloader on your Android. Here is a Bootloader unlock guide for Android phone. You need to have a TWRP recovery installed on your Android device. Step By Step Data Backup Guide for any Android Device. Copy the flashable zip file on your Android device. Boot the Android phone or Tab into TWRP recovery mode. Wait for TWRP to flash the flashable zip completely. Once the flashing is done just reboot your device. Done!!! Your Android device is now installed with the content in zip file. ENJOY. I am sure I have covered all the aspects to install a flashable zip file on Android phone using the TWRP recovery. But still if you have any concerns or any difficulties following this guide or you face some problems while installing some zip file then feel free to place a reply on this thread to get instant help.